One of the great things about hacking together projects these days is how many powerful subsystems are readily available to reuse. [Sanjeet] took full advantage of a whole slate of reusable pieces when he built R3-14 — a personal assistant robot that you can see in action in the video below. Many people started out in electronics building something simple like a crystal radio or an LED cube. But how far could you get if your projects had to begin at the most basic level, by drawing out copper wire, fabricating coils, capacitors, semiconductor devices, and batteries? Even if you know how to do all those things, it would take a lot of time, so there is no shame in using off-the-shelf components. By the same token, [Sanjeet] uses Google Assistant, 433 MHz RF transmitters, and a Raspberry Pi as components in this build. Along the way, he also contributed some reusable pieces himself, including an LED library for the PI and a library to allow Siri to control a Raspberry Pi. The last great hope for electronics manufactures is smart home assistants. The Alexas and Siris and OK Googles are taking over homes across the country. At its best, it’s HAL 9000, only slightly less homicidal. It will entertain your children, and you can order cat litter just by saying you want cat litter. This is the future, whether we like it or not. In an attempt to capture the market, Amazon has released the Alexa Connect Kit. This is an Amazon-Echo-On-a-Chip — a piece of hardware that adds Alexa to microwaves, blenders, and whatever other bit of home electronics you can imagine. The Alexa Connect Kit is the hardware behind Amazon’s efforts to allow developers easy integration with Alexa. 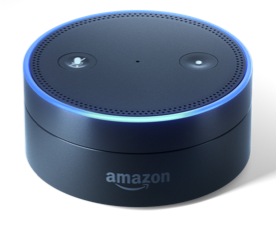 The options for adding Alexa to a product up until now have been using Zigbee to connect an Echo Show or Echo Plus, or simply giving a device the ability to connect to an Echo through Bluetooth. The Alexa Connect Kit, however, is a pure hardware solution that puts Alexa in anything. Unfortunately you can’t get one yet. Right now, the Alexa Connect Kit is just a preview, and if you want to get your hands on one — or get any specs on this bit of hardware — you’ll need to apply to the developer program. We’ve signed up and will share and juicy details that come our way as part of the program. According to the Wall Street Journal (try Google referral link if you hit the pay wall), several companies are already working on integrating the Alexa Connect Kit into their existing product lines. Hamilton Beach and Procter & Gamble are both working on something, although the press doesn’t say what kind of device will now be loaded up with a voice assistant. Amazon, however, has a microwave using the technology that the owner can, “command the microwave to do things like defrost a half-pound of chicken, or set it up to automatically reorder a favorite type of popcorn on Amazon”. Despite the sparse details, this is relatively game-changing when it comes to the world of homebrew electronics. We’ve seen dozens of projects using hacked Raspberry Pis and other microcontrollers to at Alexa to hacked coffee machines, to shoot Nerf darts, and to control a projector. If you can actually get one of these Alexas-on-a-chip, all those projects could be done with one simple piece of hardware. The future of consumer electronics is electronic voice assistants, at least that’s what the manufacturers are telling us. Everything from Alexas to Google Homes to Siris are invading our lives, and if predictions hold, your next new car might just have a voice assistant in it. It’s just a good thing we have enough samples of Majel Barrett’s voice for a quality virtual assistant. For this week’s Hack Chat, we’re going to be talking all about voice interfaces. There are hundreds of Alexa and Google Home hacks around, but this is just the tip of the iceberg. What else can we do with these neat pieces of computer hardware, and how do we get it to do that? Our guest for this week’s Hack Chat will be Nadine Lessio, a designer and technologist out of Toronto with a background in visual design and DIY peripherals. Nadine holds an MDes from OCADU where she spent her time investigating the Internet of Things through personal assistants. Currently, she’s working at OCADUs Adaptive Context Environments Lab where she’s researching how humans and devices work together. How do you use voice and hardware together? What goes into the UX of a voice assistant? How do these assistants interface with microcontrollers, Pis, and other electronics platforms? You are, of course, encouraged to add your own questions to the discussion. You can do that by leaving a comment on the Hack Chat Event Page and we’ll put that in the queue for the Hack Chat discussion. Our Hack Chats are live community events on the Hackaday.io Hack Chat group messaging. This week is just like any other, and we’ll be gathering ’round our video terminals at noon, Pacific, on Friday, July 13th. Need a countdown timer? Yes you do. Websites used to be uglier than they are now. Sure, you can still find a few disasters, but back in the early days of the Web you’d have found blinking banners, spinning text, music backgrounds, and bizarre navigation themes. Practices evolve, and now there’s much less variation between professionally-designed sites. In a mirror of the world of hypertext, the same thing is going to happen with voice user interfaces (or VUIs). As products like Google Home and Amazon Echo get more users, developing VUIs will become a big deal. We are also starting to see hacker projects that use VUIs either by leveraging the big guys, using local code on a Raspberry Pi, or even using dedicated speech hardware. So what are the best practices for a VUI? [Frederik Goossens] shares his thoughts on the subject in a recent post. Truthfully, a lot of the design process [Frederik] suggests mimics conventional user interface design in defining the use case and mapping out the flow. However, there are some unique issues surrounding usable voice interactions. Halo’s Cortana enters the real world with this internet appliance. [Jarem Archer] has built an amazing “holographic” home for Cortana of Halo and Windows fame. The display isn’t really a hologram, it uses the age-old Pepper’s ghost illusion. A monitor reflects onto 3 angled half mirrored panels. This creates a convincing 3D effect. Cortana herself is a 3D model. [Jarem’s] wife provided gave Cortana her moves by walking in front of dual Kinect depth-sensing cameras. This motion capture performance drives the 3D Cortana model on the screen. The brain behind this hack is the standard Windows 10 Cortana voice assistant. Saying “Hey Cortana” wakes the device up. To make the whole experience more interactive, [Jarem] added a face detection camera to the front of the device. When a face is detected, the Cortana model turns toward the user. Even if several people are watching the device, it would seem as if Cortana was “talking to” one person in the audience. The cherry on top of this hack is the enclosure. [Jarem] 3D printed a black plastic stage. An Arduino drives RGB LEDs whenever Cortana is activated. The LEDs project a blue glue that works well with the Pepper’s ghost illusion. The result is a project that looks like something Microsoft might have cooked up in one of their research labs. Voice-based assistants are becoming more common on devices these days. Siri is known for being particularly good at responding to natural language and snarky responses. In comparison, Google’s Assistant is only capable of the most obvious commands, and this writer isn’t even sure Microsoft’s Cortana can understand English at all. So it makes sense then, if you want voice control for your PC, to choose Siri as your weapon of choice. [Sanjeet] is here to help, enabling Siri to control a PC through Python. The first step is hooking up the iPhone’s Notes app to a Gmail account. [Sanjeet] suggests using a separate account for security reasons, as you’ll need to place the username and password in a Python script. The Python script checks the Gmail account every second, looking for new Notes from the iPhone. Then, it’s as simple as telling Siri to make a Note (for example, “Siri, Note shutdown”) and the Python script can then pick up the command, and act accordingly. It’s a quick and easy way to get Siri to do your bidding. There’s other fancy ways to do it, too — like capturing Siri’s WiFi data on your home network. How Has Amazon Managed To Make Hackers Love Alexa? Our hackspace has acquired an Amazon Dot, courtesy of a member. It mostly seems to be used as a source of background music, but it has also spawned a seemingly never-ending new entertainment in which the hackspace denizens ceaselessly bait their new electronic companion with ever more complex and esoteric requests. From endless rephrasing and careful enunciation of obscure early reggae artists to try to settle a musical argument to hilarious mis-hearing on the part of our silicon friend, the fun never stops. “Alexa, **** off!” it seems results in “I’m sorry, I can’t find a device of that name on this network”. That is just the experience of one hackspace, but it evidently does not end there. Every other day it seems that new projects using Alexa pass through the Hackaday timeline, so it looks as though Amazon’s online personal assistant has been something of a hit within our community. Fair enough, you might say, we’re always early adopters of any new technology. But it’s a development over which I wonder; am I alone in finding it surprising? It’s worth taking a moment to look at the subject.